The Power of the Heart-to-Heart Connection. Melissa snuggling into my heart. Melissa has been with us just over a year. Her integration has been full of challenges for everyone. She’s been teaching us and we’ve been teaching her, too. Recently, it occurred to me that creating a permanent heart link with Melissa would help her feel more accepted and more loved. She was eager to do it, even after I reminded her that I already have this connection with Violet and Echo and Starlight. 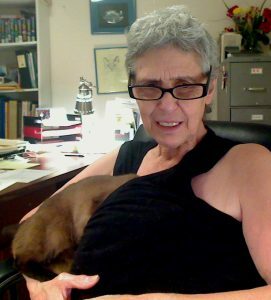 Once it was created, Melissa began getting into my lap and doing her best to climb inside my shirts. As you can see, she doesn’t always fit completely inside it. 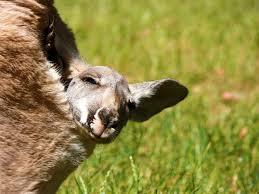 Joey in mom kangaroo’s pouch. Although she’s the youngest member of my feline family, Melissa sees herself as the dominant cat, or “top cat.” Because this is Sakhara’s position, and Sakhara isn’t ready to retire, the two of them have had some difficulties. Sakhara, age 19, is a very grounded, Earth-energy being who doesn’t believe in fighting. 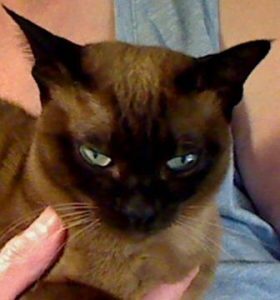 She will hiss and will raise a paw to cuff with claws sheathed, but she won’t start a fight and won’t participate in a fight. In contrast, Melissa is very young (about 18 months old now) and full of energy. She had been swatting at Sakhara and going out of her way to do it. Even when we were all sitting quietly on the sofa, Melissa would suddenly approach Sakhara and hit her in the fact. Sakhara began jerking her head back in anticipation of being hit whenever Melissa approached her . Melissa would also come up to Violet and hit her in the face or jump on her head and back, which can injure Violet, age 17 and a bit frail. 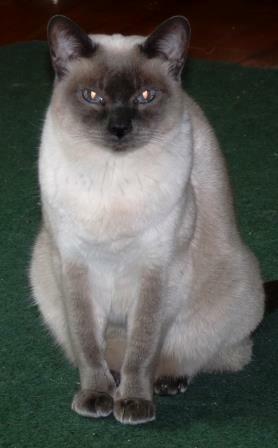 Starlight, age 4, loves to wrestle and play with Melissa, but doesn’t expect to be hit. The few times Melissa raised a paw to her, Starlight was startled and gave Melissa a disdainful look. To stem the wave of aggressive behavior, I pulled out all the stops. hands-on-healing techniques whenever they seemed called for. I’ve had varying successes, all short lived. I also took a more rational (and sometimes irrational) approach. I explained, and explained, and yelled, and explained the “house rules,” and finally even did a “time out” or two with Melissa, all to no avail. I reassured Melissa that we all loved her and that hitting anyone was unacceptable. She’s a brilliant cat, and I knew she understood. Why was she continuing to hit everyone? Hitting is different than the play she does with Starlight. Together they chase, jump on each other, wrestle, and bite and chew on each other. “Sneak attacks” are common and accepted by both. They also cuddle and sleep together every day. When I began training in The Emotion Code™, Dr. Bradley Nelson’s amazing system for eliminating emotional blocks, Melissa was one of my first “clients.” I got some good results, but the hitting continued. 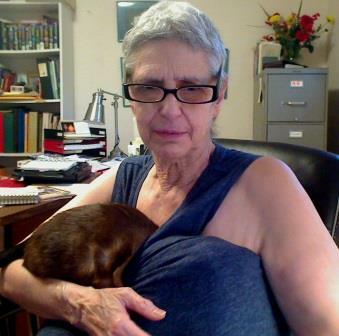 Melissa heart is very defended and I have not yet removed the barrier she put there for emotional protection. Melissa had a neurological disconnect. She was unable to remember not to hit. She KNEW hitting was unacceptable. She just couldn’t stop herself from doing it. This was new information for me. I had this insight when I started reconnecting her neurological system. My next insight was that Melissa had not be able to talk to me about it until I began to reconnect and realign her nervous system. Not being able to talk about it was another symptom of the problem. What would protect the other cats while Melissa’s healing went forward? During the family conference, I explained to everyone that Melissa was having difficulty remembering not to hit. I invited Violet, Sakhara, and Starlight to all help Melissa. Each one agreed to remind her, from time to time, not to hit. After observing her behavior for a few days, I was amazed that she no longer even raised a paw to strike. I checked in with the other felines. How frequently were they reminding Melissa not to hit them? They said they didn’t need to remind her, as it didn’t seem to be a problem any more. I had also observed the Melissa was unusually sweet and cuddly, more so than ever before. In the 1960’s and 70’s there were Encounter Groups where people participated in games to learn more about how they interacted with others. In one activity, everyone would form a circle holding hands, leaving just one person out, and that person had to try to get into the circle. This revealed each person’s style for getting into a social group that seems to be closed. become a member of the group? While I don’t have a definitive answer to my question, one thing is clear: Melissa is now transformed. She no longer hits the others, although I’ve seen a paw raised once or twice, and she’s much more affectionate towards me. During this time on Earth, as we’re all being encouraged to become heart centered, to live from our hearts, and to connect through our hearts. Melissa is demonstrating almost daily to me the power of the heart connection. Structured Water Is Extending Violet’s Life. 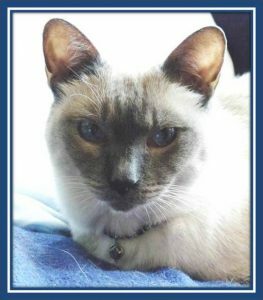 Violet has been in stage 2 renal failure since the fall of 2014. 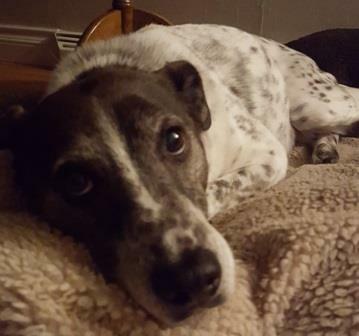 She is now 17 years old and doing amazingly well. Here’s how I take care of her. She eats a raw food diet, which means that all the water in the cells of that food is already structured. I add structured water to the raw meat because when you cut or grind meat, some of the naturally structured water from within the cells is lost. When I add some structured water back, the meat readily absorbs it. This makes it easier for Violet to get more water while eating. To prepare the veggies, I soak them in structured water before pureeing them. — This changes the water in the cells of the veggies to structured water. — Water that has gone through a Structured Water device by Natural Action Technologies automatically neutralizes all toxins vibrationally that might be in the veggies. All the water that Violet drinks is also structured. Kidneys have a much easier time cleansing the blood when all the water in the blood passing through them is structured. Structured water makes it easier for the kidneys to do their job of cleansing the blood. When kidneys are struggling or feeling weak, it’s good to make their life easier. Structured water also helps makes all the cells in the body healthier because cells stay healthy when they aren’t clogged with waste products and when they receive all the nutrients they need to function correctly. 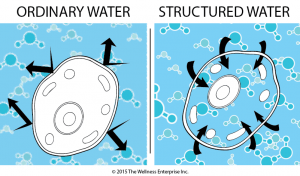 How structured water affects cells. 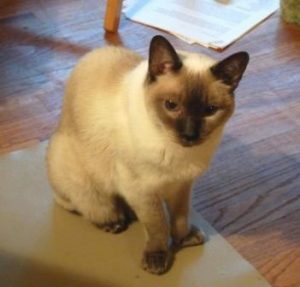 When Violet was diagnosed with renal failure, she was already on a raw food diet and drinking structured water. I just added some electrolytes to her diet every day to make sure she was getting lots of trace minerals. She has gained back the weight she lost when her kidneys first became imbalanced. She has become more active and more playful since then, too. Her eyes are bright and when you look at her, she’s radiant – she positively glows! 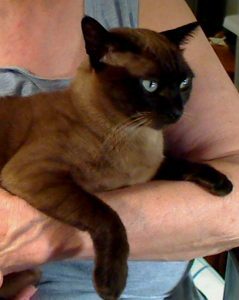 At age 17, she started bouncing around the house again, and running (yes, I did say running) up the stairs from time to time. Yesterday, she jumped into the cat tree, which she hasn’t done in years. Cats in renal failure need to drink more water because additional water helps cleanse their bodies of waste products. Cats won’t drink water if they don’t like the taste or the smell. I know of cats who won’t drink enough water because they can smell and taste the chlorine. A structured water device reduces or eliminates this problem. Structured water tastes better than any other water available. My cats all love this water. WHERE DO I GET STRUCTURED WATER? I just open any tap, and out comes structured water. I have a “whole house” structured water device from The Wellness Enterprise. HOW CAN YOU HAVE STRUCTURED WATER? Not ready for a “whole house” device? You can get structured water devices for under the sink, for the shower, and even a portable. Learn more about Structured Water devices HERE. One of the most important nutrients for cats in renal failure is potassium in the form of a mineral salt. When the kidneys are not functioning properly, potassium and other mineral salts tend to be washed out of the body. This can lead to vomiting, reluctance to eat and to drink plain water, heart attacks, and death. If you’ve ever needed electrolytes due to heavy sweating during the summer months, you know that being low in minerals salts is not pleasant. Most people drink a mixture filled with chemicals and sugar. The sugar keeps the electrolyte formula from tasting bitter, and helps increase blood sugar rapidly when the body is depleted. In an emergency, fluids of this type may be given intravenously. Regular veterinary medicine uses medications and subcutaneous fluids (fluids injected under a cat’s loose skin near the neck) as their solution to low potassium levels for cats in renal failure. I prefer a natural approach. One of my friends has used Pedialyte in the past with her cats. Pedialyte is a brand of electrolytes made for small children. I looked it up online, and found it had too many chemicals in it for me to give to my cats. So – I kept searching, and soon found a homemade, all natural, formula someone had devised for her children. I altered it to make it suitable for my cats. This is what Sakhara (who has had renal disfunction for more than 2 years now) and Violet are both taking. I administer it by dropper. Both cats will take it readily. It works just fine. Please read the disclaimer at the end of this article before trying this on your own. Thank you. My veterinarian and I discussed the exact amount of potassium required, so I know the proportions are correct for my cats. Add the sea salt and potassium salt.. The serving size for MY cats to start off was 3 dropper pulls from 1 ounce dropper bottle. (This is about 1 full dropper. Check with your veterinarian to determine the correct amount for your cat.) NOTE: I reduced the serving size when I felt that my cats’ potassium levels were restored to “normal” and that they needed less as daily maintenance. I also make adjustments for hot summer days when they need to drink more water in contrast to cooler weather. I use muscle testing to determine when and how much of a change is appropriate for my cats. If you are not trained to muscle test, please consult someone who has this training or consult your veterinarian. Squeeze the liquid into a small cup. Then use the extra dropper to dose your cat. ALWAYS put the liquid into the SIDE of your cat’s mouth. This prevents choking. Put a few drops ON THE CATS TONGUE. Allow the cat time to swallow and TIME TO BREATHE between swallows. Gently stroke your cat along the spine as the cat is swallowing and breathing. This helps you both relax. In the beginning, I gave 3 to 4 times a day for a few days to my cats. After 3 to 4 days, I was able to drop back to dosing twice a day. If you feel your cat needs more, discuss this with your veterinarian. When you first start giving electrolytes, your cat’s potassium levels might be very low. If this is the case, yout cat would benefit from 3 to 4 servings a day for a few days. If you cat’s not eating, you can give some by dropper and then add a squirt or two extra into the food. Many cats will start to eat again when their potassium levels go up. The salt will also make them thirsty and they’ll start to drink again. If you feel your cat still refuses to eat or drink, take your cat to the veterinarian immediately. There are occasions when subcutaneous fluids are a valuable emergency measure. My cats have been taught to accept liquids from a dropper. If you’ve never done this before with your cat, you can start by giving the cat a bit of room temperature water with the dropper. The cat may resist at first, but will find that “It’s just water.” This increases the cat’s willingness to accept from a dropper. If your cat is healthy now, I’d get the cat used to this idea by giving some drops of plain water by dropper every now and then so that ultimately, your cat doesn’t think anything of this. That’s what I’ve done with Starlight, the youngest member of my feline family. 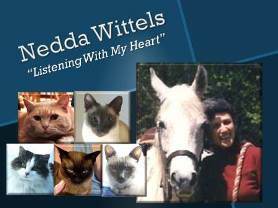 Nedda Wittels is not a veterinarian and does not diagnose or prescribe medications or treatments for humans or animals. For diagnosis and treatment of cats with kidney disease, please consult your veterinarian. The information provided here describes what worked for my cats. You are advised to discuss this approach with your veterinarian before trying it.